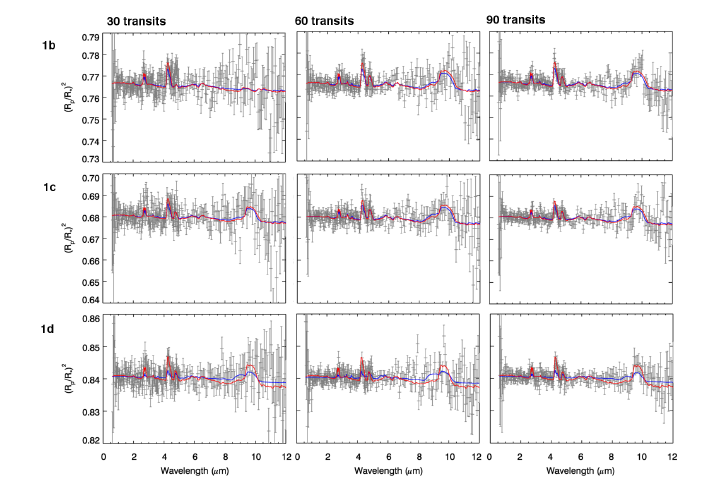 Title: Habitable worlds with JWST: transit spectroscopy of the TRAPPIST-1 system? For a few days at the beginning of May, astronomers around the world watched a webcam feed in a mix of excitement and trepidation. 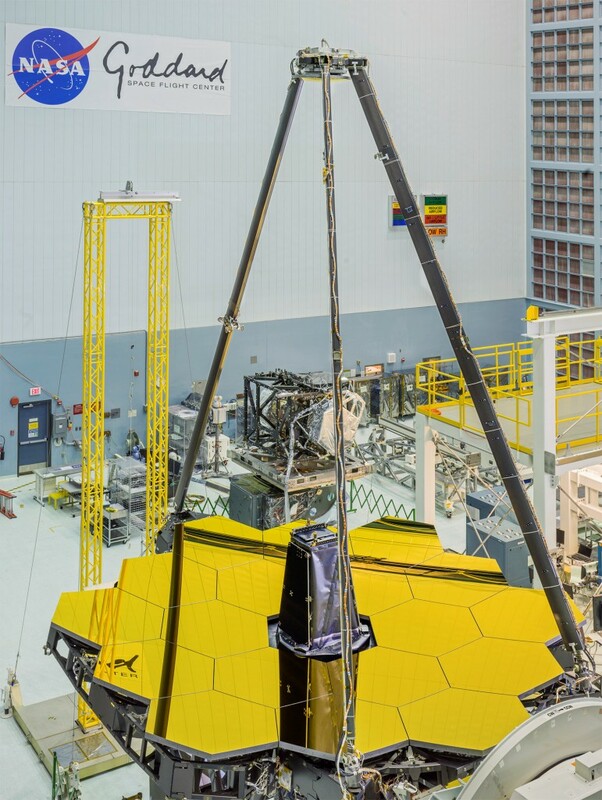 One by one, technicians at NASA’s Goddard Space Flight Center were carefully removing eighteen hexagonal covers, revealing the huge, golden primary mirror of the James Webb Space Telescope (JWST). Scheduled for launch in 2018, JWST will be the largest space observatory built to date. Deployed 1.5 million kilometres from the Earth, its 6.5 meter mirror will peer deep into the infrared sky, cooled to just 50 Kelvin above absolute zero by a tennis court-sized sunshield. But what is JWST for? The authors of today’s paper suggest one possible use for the giant new telescope: searching for signs of life on other planets. Life on Earth has left unmistakable marks on the planet’s atmosphere, most notably the vast quantities of oxygen produced by photosynthetic organisms. Astronomers have therefore suggested that searching for oxygen, along with other “biomarkers” such as methane and ozone, in the atmospheres of planets beyond our Solar System could be the key to uncovering alien life. Recently, a planetary system has been discovered that Barstow & Iwrin show may be a good target for such observations. Trappist-1 is a tiny, ultracool red star just 40 light years from the Earth. Less than a month ago, the discovery of not one, but three Earth-sized planets around Trappist-1 was announced. Intriguingly, each of these planets orbit near to the habitable zone, the region of space around a star where the temperatures are suitable for a planet to have liquid water on its surface. Whether or not the Trappist-1 planets actually have water is already being actively discussed. To see if JWST could be used to find biomarkers on the Trappist-1 planets, the authors turn to spectroscopy. The technique would be to observe the system as each planet transits (passed in front of the star), splitting the light into its component colours, or wavelengths. Although most of the signal would come from Trappist-1 itself, a small amount of light would shine through the (hypothetical) atmosphere of the planet. The molecules in that atmosphere would each absorb light at specific wavelengths, leaving a distinctive mark on the spectrum. Figure 2: Simulated spectrum of a Trappist-1 planet in the infrared wavelengths observed by JWST, assuming an atmosphere broadly similar to that of Earth. The various coloured lines show the spectrum for different amounts of ozone, ranging from 100 to 0.000001 times the amount in Earth’s atmosphere. The authors first produced a theoretical spectrum of the Trappist-1 planets’ atmospheres (Figure 2). 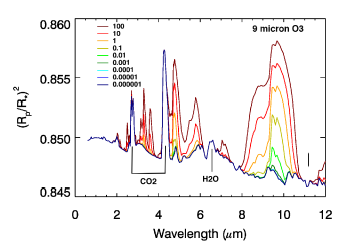 At the wavelengths observed by JWST, the best biomarker to search for is ozone, which produces the strong signal seen at 9 microns in Figure 2. The authors find that, as long as the planet has more than one-hundredth the amount of ozone in Earth’s atmosphere, then it has a chance of showing up in the spectrum. Simulated JWST spectra for the three Trappist-1 planets after, from left to right, 30, 60 and 90 transits. The temperature of the planets is uncertain, so the red and blue lines show the predicted result for hot and cold planets respectively. But how long will it take to observe it? Figure 3 shows the next step, simulating the spectra after many JWST observations. For the innermost planet, Trappist-1b, the ozone feature shows only after 60 transits. However the other two planets are much more promising, with clear ozone feature after just 30 days. The authors get the best result for the furthest out planet, Trappist-1d, with not just ozone, but also carbon dioxide seen after 30 days. This is also thought to be the planet most likely to have liquid water on its surface. Is Trappist-1d then the ideal target for a search for life with JWST? The authors point out a hitch in the plan. To get the full simulated spectrum, the transit will need to be observed 30 times each by two of JWST scientific instruments. Trappist-1d has a (roughly) 18 day orbit, and JWST will only be able to see the system for about 100 days a year. That means it will take at least ten years to get the full 60 transits needed! The second planet, Trappist-1c, wouldn’t take as long, but is less likely to be habitable. Is that it then for biomarkers? Maybe not. The authors finish by pointing out that searches for close-by systems like Trappist-1 is ongoing, and closer systems to Earth may soon be discovered. If they are, this study shows that JWST will be able to search for signs of life in their atmospheres as well. Exomoons disguised as aliens Are Exomoons Habitable? In Search of the First Habitable Exomoon Buy One Spectrum, Get a Light Curve Free!